Maggie, as mentioned earlier, was an actress, probably the first native-born Californian actress to achieve world-wide fame on the stage. Ironically, she achieved her greatest fame in Australia, and spent most of her life there. She was born on July 10, 1851. She attended Rincon Hill Primary school up to the age of eight. It seems like precious little book learning, but it's more schooling than either one of her parents got -- both were illiterate, apparently. After leaving school, she made her debut at the Olympic Theatre in San Francisco, earning $50 a week. Her career really took off when she married J.C. Williamson, a comedian who had joined the cast of the California Theatre Company in place of John Raymond, an extremely popular and respected actor. Jimmie, as he was called by those who knew him well, was born in Mercer, Pennsylvania, on Aug. 26, 1845, the son of an Irish Presbyterian surgeon, James Hezlep Williamson and his wife, Selina Campbell. He was raised in Milwaukee, Wisconsin. Viola Tait says his mother died when Jimmie was 10 years old, and his father, who had apparently become well-known in Milwaukee, Wisconsin, died two years later and that Jimmie went to live with an uncle; Dickers says, however, that his father died when he was 11 or 12, and his mother didn't die until June 1878. J.C. Williamson was beyond doubt ambitious. Hal Porter, in his book "Stars of Australian Stage and Screen," writes that Williamson "was not a tall man, and was driven by the need to have that sense of increased inches given by power and money." However, Viola Tait gives another explanation of his ambition: His uncle, who told him that "to be a failure or a mediocrity on the stage is as bad a fate as a man can have." Not that this uncle was in favor of his nephew going on the stage -- Jimmie ran away to join a theater company, but was sent back home. But the dream persisted, and finally his uncle gave in, letting him take a job as a ticket seller and usher in a Milwaukee theater. He was to hold virtually every job possible in the theatre, from actor to scene painter, from carpenter to playwright, and from ticket seller to impresario. Williamson had achieved no small popularity himself in the Old Broadway Theatre in New York as principal comedian. Eventually he was hired as principal comedian at the California Theatre, where he met three people who would play key roles in his success: Dion Boucicault, the Irish actor and playwright; Sam Smith, a miner; and Maggie. Boucicault's works were an important a part of Williamson's repertoire later on. 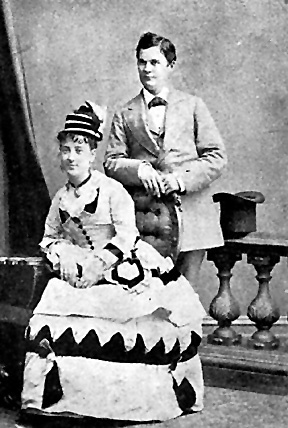 Boucicault and Williamson's association began when they played together in a sketch called "Boucicault in California." The play consists of Boucicault being interviewed by a series of reporters, and he says everything he expects the critics to say about him, because, according to Tait, he has heard they intend to give him a grilling, so he decided to pull the rug out from under them by saying it all first. Tait seems to indicate that Williamson performed this in 1868, but Dickers says it was performed in 1874, after his marriage to Maggie. At the time he met Maggie, she was a familiar and well-loved figure on the stage -- the favorite daughter, if you will. In the very popular, talented but unschooled Maggie, he saw the means to fulfill his ambitions; Dickers seems to think that he courted her for this reason. According to him, he first made her an offer to join a theatrical company he was going to start, and she turned him down. So he then proposed marriage and the theatrical engagement, and she accepted that -- but then they had to overcome Bridget's objections to him. What those objections were is unknown. A possibility is that she objected because Williamson was not Catholic (though they were married in a Catholic ceremony). Whatever those objections were, if Bridget were a representative female of this side of the family, they were strongly made. He soon found a play called "The Dead, or Five Years Away," which was offered to him by a 49er named Sam Smith. Williamson and a fellow called Clay M. Greene expanded and revised it and renamed it "Struck Oil." The piece is about John Stofel, a Pennsylvania Dutch farmer who buys some land right before enlisting in the Civil War. He hides the deeds to his farm and the additional land and tells his wife not to sell the house under any circumstances. When the war ends, Stofel fails to come back, and his wife concludes he's dead. Oil has been found in their town, but the man who sold them the land is now trying to renege on the deal and also is trying to buy the Stofels' original land, with the house, from the presumed widow so he can find the deeds. Stofel is, however, not dead; he's just been wounded and lost his memory. Five years after leaving, he somehow manages to find his way home, where he regains his memory, the villain gets his comeuppance, the Stofels become filthy rich and live happily ever after. The piece was tailored for both Williamsons. "With the shrewdness of one who had learnt by hard experiences what tickles the cheaper fancies of the public," Porter said, "he interpolated in 'Struck Oil,' already an openly sentimental piece, numerous 'warmly human' opportunities for Maggie Moore to... sing in dialect, dance, and mimic famous actresses." It also gave Williamson the opportunity to act in dialect (something he was quite famous for in New York), submerge his personality entirely in the role, including a complete transformation via makeup, and (at least in the second revision of the play) perform stage gymnastics. Namely, he "contrived to carelessly fall twenty feet from an oil derrick without breaking his neck."